This is one of my favourite comfort food dishes. It’s the combination of rice and peas, like the Italian risi e bisi, that I find particularly irresistible. 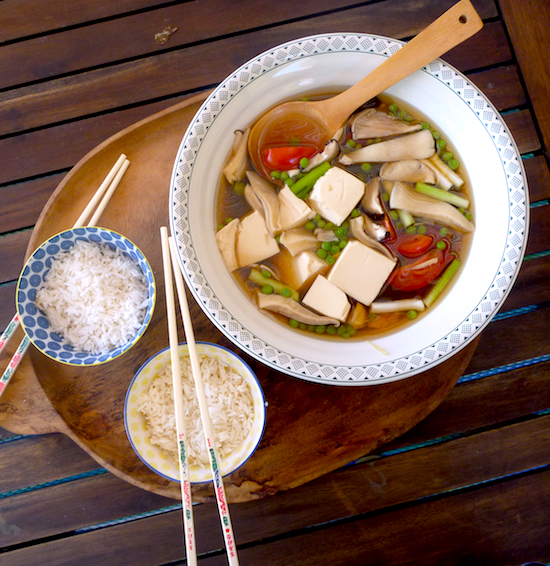 There is something very cleansing about this dish, which really allows the silken tofu to shine. The recipe comes from Kylie Kwong’s Simple Chinese Food – the original version is slightly brothier, with less peas and served with leaves of iceberg lettuce, which would give a nice crunchy contrast, but I’ve always just served it like this for a simple meal for two, or with a Chinese omelette and another vegetable dish if I want to make a larger meal. 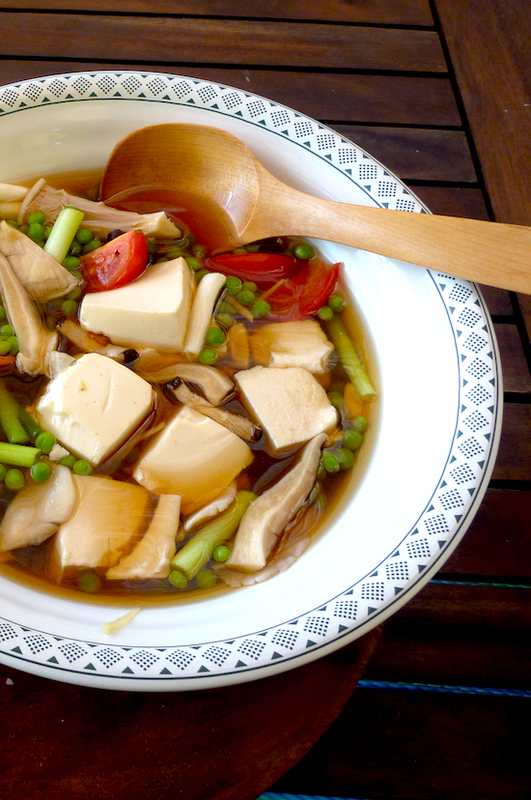 Gently remove tofu from packet and slice into six pieces and drain off any excess liquid. Place water, soy sauce, wine or sherry, sugar, ginger and salt into a wok and bring to a gently simmer for a few minutes. Gently slide tofu, tomato, mushrooms, peas and spring onions into broth, separating the tofu as you place it in the broth. Simmer uncovered for five minutes until vegetables are just tender. Take off heat and add sesame oil and vinegar. Pour into a large bowl, sprinkle with pepper and serve immediately. I really like this idea, Elizabeth; it is nice to find a Chinese dish that is NOT centered on pork or other meat. Keep these coming. This looks so good, I’m coming down with a cold and I think this would make me feel a lot better. ooh here’s where tofu and I face a standoff. I wonder if I can do it! I find it hard to believe you can’t stand any tofu. I’m going to post a pan fried tofu recipe soon that’s really, really good, Maybe that will convert you.